It's taken me a long time to get to a place in my fitness life and training cycles to realize that recovery is just as important to running and strength training. I define recovery as replenishing the body - whether it come in the form of rest/refueling/rehydrating/stretching. It's all important and you really cannot disregard recovery at all. I was offered the opportunity to review the Teeter Hang Ups. My kids love to call it the teeter totter, but it is definitely not that. This is far cooler and has many more benefits than a teeter totter. Plus you can hang out (upside down) on the Teeter alone and do not have to rely on anyone to be on the other side. It's great for back pain, increasing blood flow in the legs. Hello long run recovery! 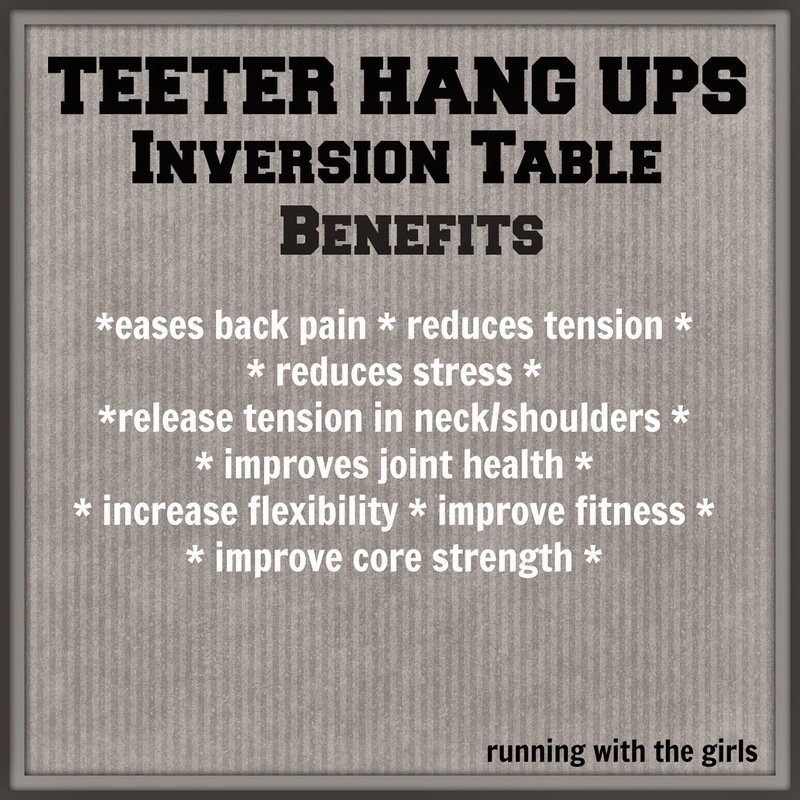 The Teeter Hang Ups is an inversion table and it's rather simple to put together and to use. I put the Teeter together by myself - and I'm not very good at putting things together. There are very easy to use printed directions and a DVD with directions. Once I got it together, the kids and I watched the instructional DVD, read through the warnings, and then we had to try it out! Not only is it fun.... it's so good for you! It's like a fun recovery tool - something you really want to do. I was so excited about the Teeter, I had to tell my chiropractor at my monthly adjustment appointment! She was equally excited and went on and on about all of the benefits of an inversion table. 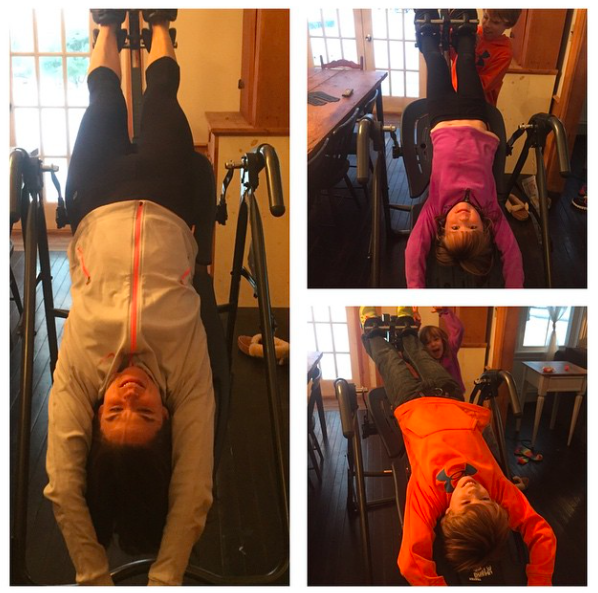 As I read more about the Teeter and the benefits, I was intrigued by improving fitness. I could easily understand reducing back pain, increasing blood flow, but improved core strength. Yes please! It is taking me quite a bit to get the hang of it, but I'm working on doing some curl ups while hanging in the 180 position. There are some health warnings that do come along with the Teeter Hang Ups. You should make check with a medical professional prior to using. You should not use it if you have a middle ear infection, extreme obesity, pregnant, hiatal hernia, ventral hernia, glaucoma, retinal detachment, conjunctivitis, high blood pressure, hypertension, heart or circulatory disorders, spinal injury, cerebral sclerosis, acutely swollen joints, recent stroke or transient ischemic attack, bone weakness, recent or unhealed fractures, medullary pins, surgically implanted orthopedic supports, or using anticoagulants. Disclaimer: I was offered to review the Teeter Hang Ups through my affiliation with Hawke Media. I was not paid for this review and was not required to give a positive review. As always, all opinions expressed on my blog are 100% my own.